Tired of the African tales of misery with which we find ourselves bombarded every day, new author Chris Harvie sets out to find the good news on an epic 28 000-kilometre journey between the Kruger National Park and the Nile in Uganda through eight African countries. In this book, with his tongue firmly in his cheek, he chronicles his discoveries, the quasi-British post-colonial characters of Botswana, Zambia, Tanzania, Uganda, Kenya, Zanzibar, Malawi and Namibia and the joy and laughter he encounters on the way. Delightfully opinionated, brimming with interesting facts, questionable comment and dubious speculations, this book is essential reading for both armchair and actual travellers. Harvie meets missionaries and mechanics, locals and ex-pats, rascals and rogues and throws them into a melting pot of ideas and opinions, resulting in a highly entertaining account and a fresh view of southern, central and east Africa. 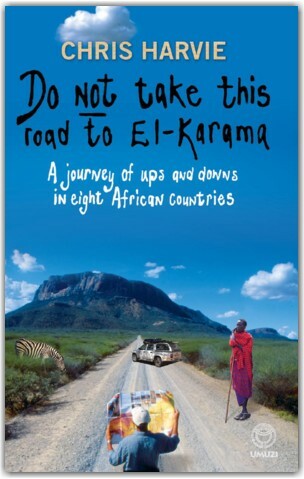 A blend of discovery and discomfort, Do NOT Take This Road to El-Karama breathes new life into the travelogue genre, with an original take on the style and presentation of a journey, and leaves the reader enthusiastic, refreshed and reaching for a tent and the keys to the pick-up.